Persistent itching and scratching of the scalp damage the skin layer. Eventually, the skin tries to heal itself and in the process, the blood and skin tissues accumulate and form a crust which is known as a scab. Scabs can be very itchy, irritating, and in some cases odorous. Scabs represent many scalp conditions like eczema, lice, psoriasis, and others. Learn about various causes of scabs here. Eczema: People suffering from eczema also get affected with patchy scalp skin, and bleeding and itching blisters on the scalp. Scratching these blisters leads to scabbing on the scalp. Oily scalp: People with oily scalp are prone to scabs since they frequently get dandruff and scalp sores. Dermatitis: Inflammation of the scalp skin due to contact with any allergen (contact dermatitis) or due to excessive oil and sebum secretion (seborrheic dermatitis) causes scabs. Psoriasis: This is a skin condition where the white blood cells of the immune system attack normal and healthy skin cells causing redness, dryness, and itching. Psoriasis on the scalp can cause scabs. Shingles: Shingles is a viral infection which causes rashes and blisters on the skin. When the blisters present on scalp dry up, they leave scabs on the skin. Lice or ringworm infection: Scratching scalp to get relief from the itching triggered due to lice or ringworm infection of the scalp results in patchy and scabby scalp. It is always advisable to consult a dermatologist and get treated for the original cause of scabs like eczema, psoriasis, shingles, and others. 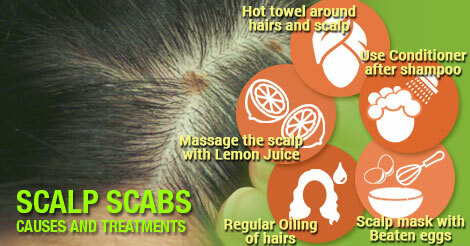 Following which, you can use these home remedies to get rid of the scabs. Hot towel: Take a towel and dip it into the moderately hot water and then squeeze it. Wrap this hot towel around your hairs and scalp for 10-15 minutes. The steam loosens up the scabs which can then be removed easily by combing and head bath. Lemon juice: Add 10-15 drops of lemon juice to warm oil and massage the scalp and let it stand for at least 30 minutes before shampoo. It may irritate a bit, but will help you get rid of the scabs due to its astringent and anti-bacterial property. Scalp mask: Beaten eggs or freshly extracted aloe vera gel can act as perfect scalp mask. Application of scalp mask, once every week, keeps your scalp skin moisturised and itching free. Best ways to avoid scabs are regular oiling of hairs using olive oil or coconut oil, using conditioner after shampoo, avoiding excessively hot water on the scalp, and get treated immediately if you have any skin condition. 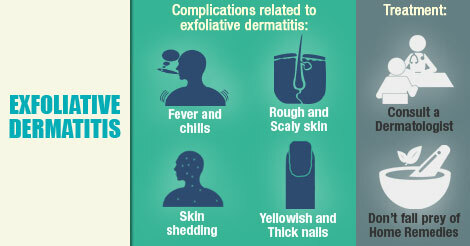 Exfoliative dermatitis is a fairly uncommon condition where inflammation of skin causes redness, exfoliation and peeling of skin over the large areas of the body. Turmeric is a common spice in Indian kitchens and most of us are aware of its medicinal and cosmetic properties. Application of turmeric mask made up with either gram flour or Multan Mitti is a routine practice among teens. 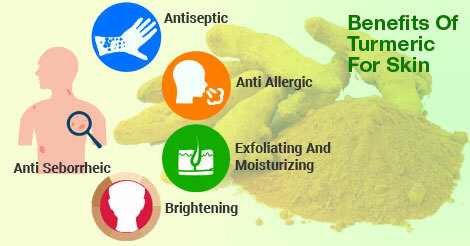 The traditional medicine has now got approval from various scientific studies for its amazing actions on skin.